If the world were upside down, what would it look like? Ever wondered what would happen if you start to write “upside down”? Isn’t that great? I like it! Typeupsidedown.com is an easy website with 2 textboxes. You fill out the first one with your message. Simultaneously it will create your text upside down in the second box. 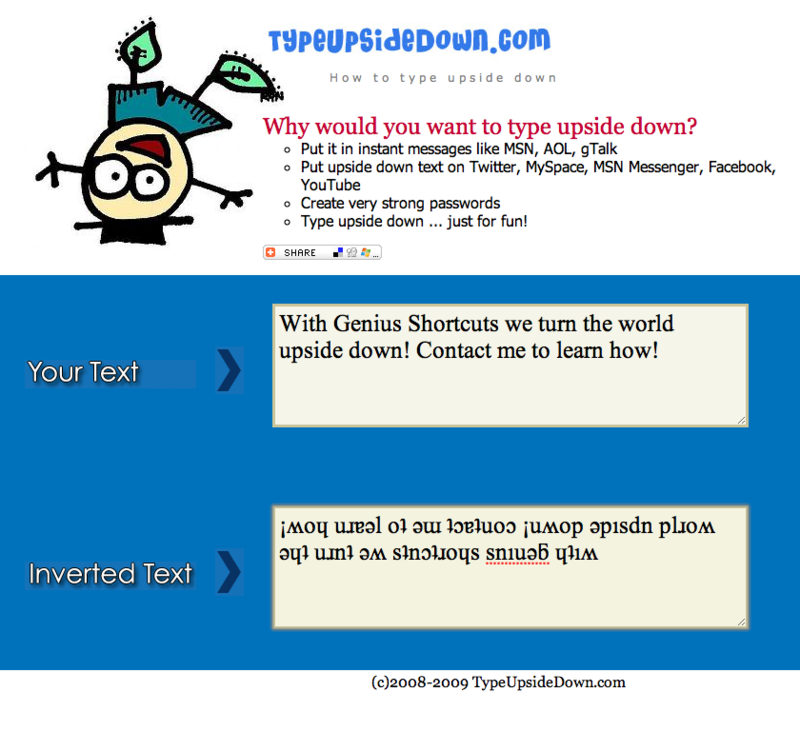 Now you can easily copy and paste the upside down text to other applications and have fun with it! It’s fabulous to fail! Yes, that’s right: It’s fab to fail! Why? The more you fail, the more likely you are to succeed! For most people, failure is considered a (very) negative thing. As with fear, many people get paralyzed by failure. By avoiding failure, we end up limiting our success. Just to be clear: We need to focus on trying to succeed, not trying to fail! You see, instead of handling failure poorly, we should handle it in a better way: it’s a learning opportunity! Be happy with yourself for trying…Why did you fail? What lessons can you learn from it? What can you do to make sure you avoid failure again? For me, failure is bad, if indeed we don’t learn from it. If we don’t change anything and fail again (and again) the next time. I sometimes look at failure as a test. “I thought I had a great strategy, but apparently it wasn’t the case.” I will get up (again), learn and tap into my creativity to unlock new approaches and better strategies. To overcome failure, something must change, so you start to analyze, examine and scrutinize. You adapt and grow! If you keep in mind what happens in the movies, you will also agree that sometimes heroes are not as successful as they appear. Every hero is successful at the first try. NOT! They often fail (more than once!). What they do differently is they keep pushing forward. They learn from their mistakes and adapt. They sometimes fail spectacularly, but yet they push further and they ultimately get what they want. It can happen to you too! Only if you are willing to learn from your mistakes! So, it’s fab to fail, because you will discover new insights and you are about to have a breakthrough. You are in the process of growing and another step closer to what you want! My final question is: Look back at your last failure. What did you learn from it? Thanks for sharing! It is easy to quit! Some say that “Loosers are winners who quit”. Some people just need a small excuse to give up. Sometimes you come across people who are very close to achieving their goal. Even when the finish line is in sight and looks hardly attainable, they refuse to give up. In this video, you will see Holland Reynolds, a 16 year-old cross-country runner in California, collapse just a couple of feet away from the finish line at the state cross country championship. She finished the race by crawling past the finish line. Impressive! She did not win the race, but she won! How? Despite complete exhaustion, Holland Reynolds pushed herself to honor her coach (diagnosed with incurable Lou Gehrig’s disease) and advance her team. She not only completed the race, overcoming her cramps, but thanks to her effort the team won the national championship! Everytime you are on stage or before an audience, several fears sneak up on you. One of them is the fear of “looking like a fool”. The last thing you want to do, whatever it takes, is to look like a fool, right? Chances are that it will never happen to you! However, if you want to increase the chance of success, I suggest you create a willingness to look foolish. Why? Well, if you are willing to look silly, the fear won’t have a strong impact on you any more. The fear will dry up. And you know what? In case it really happens, you probably will laugh with it, rather than to try to hide it or to minimize it. By facing our fears, you might be able to solve them! You are currently browsing the BERT VERDONCK, lifehacker & networking coach blog archives for December, 2010.